People consider emigration from their home country for various reasons. Some want to move to Australia to find a better paid job and lower cost of living. Others are attracted by the weather and different lifestyle. For many people, moving Down Under means a clean start. As with any new endeavor, people are quite optimistic and tend to ignore prospective problems. Immigration is serious step to take and a milestone in people’s lives, so we need to be level-beaded about it. 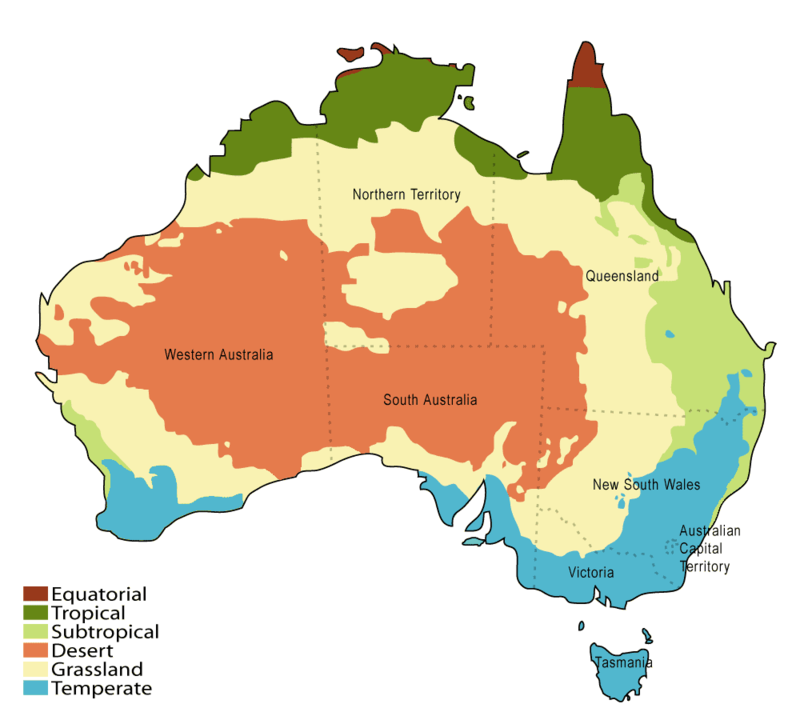 Australia’s Climate – If you are emigrating from the United Kingdom or Ireland, the sunny weather can be enough of a reason for you to switch countries. Consider the fact you are moving to a country with a colorful climate map. You can easily end up at the other end of the thermometer. High temperatures should be considered as they can easily cause health problems or even casualties. You have to consider what climate suits you best. I suggest this to be a starting point for you in choosing where to live, as an attractive job opportunity simply doesn’t compensate for your health. Job opportunities and costs of living – Check if you qualify for an occupation from the new Australian SOL (Skilled Occupations List). Average Australian salaries might seem attractive and the tax brackets reasonable, but they are only prerequisites for improving your living standard. Your current lifestyle and future plans are the two main variables in the equation. You definitely need to know your net worth on the Australian job market. Beside the climate, this is probably the second most important factor in choosing an exact location to migrate to. Check what your options are by browsing through some recruitment options. The overall unemployment rate in Australia is 6.3%, however it varies on different states. The overall unemployment rate in Australia is 6.3%. Crime rate – The crime rate decreased dramatically over the past 10 years. A detailed survey by the Australian Bureau of Statistics reveals the kind of problems Australian states have. You should definitely have a look at it, when choosing a place to live. Some states have bigger problems with assaults and attempts of such and some are more concerned with the higher count of robberies. Migrants have to consider many other factors. Leaving to another country means that you change the life of you and people you know, friends and relatives alike. Also, if you are moving Down Under with a child, you might be interested to learn more about the local education system. Basically, school education is mandatory in Australia for all ages between 6 and 16 and it’s divided into primary, secondary and senior secondary school. You can find a full list of all Australian education institutions here. You also might prefer to move somewhere you can find more fellow-countrymen. You will need to have some cash in order to ease the transition. Those rainy days savings will really come in handy in the first 2-3 weeks, while you are settling in. The migration process will take at least 6 months. If you are considering immigration to Australia, you have to prepare for a lengthy procedure. Usual processing time with Visa First is 7-8 months. Visa First processing fee is EUR 2950 plus additional EUR 500 if you are migrating with your family, paid on consequential stages. Immigration fees are extra. Your application will be professionally assessed and further instructions and guidance will be provided as the process goes on. For additional information about Australia Skilled Migration you can e-mail us at contact@visafirst.com. Hi, I’m 34 years and I want to move to Australia, what document do I need? Please, help me. I’m 22 and after finishing university I would like to move to Australia for around 6 months to work. What visa do I need to apply for? im 30 and have been working in the IT call centre profession for 10 years. i am looking at emigrating and have an auntie and uncle who live in australia. im aware that a succesful application is based on a points system. could you advise if id be succesful with family members and being an IT Professional. hello, i ve got my work visa all sorted there’s 2 things id like too know. 1 will i be ok on a 1 way flight ( i will have a fixed address and i am also looking for a sponsor). 2 do i need a company who can transfer my money or can i just get a bank account when i am out there. Hi im 20 and have been working in the police for the past 2 years in the uk and was woundering the best place to move to in either Melbourne or Brisbane. Also, what visa should i apply for and how long roughly will it take? I will be out there permanantly. i have just started my visa it is a permanent visa just wondering how long it will take. Hi, My partner and I would love to emigrate to australia. Can we still apply even though he has only just qualified as an electrician? I recommend to order Cialis without any hesitation. After treatment with Cialis my erection problems have completely gone. Sometimes I get a pain in my back which quickly passes. But most likely this is not a side effect of Cialis but the consequences of sexual activity. My body is not ready for such loads. im a student leaving college in july as a masarge therapist, and my parter is a barman, although he is 23 and his dad is austrailian… what is the best way to go about it to live in austrailia and settle down? Hi there,ok so last year i came to australia on a tourist visa and i met a man and i went home applied for my working holiday visa and i am now back here,im living with him,i have been here 3 months now and i know i have to do farm work to get my second visa but what do i do after my second visa to stay in the country living with him? My boyfriend and I are moving to Adelaide in January 2011. He is a resident there, currently working in America due to his work in Australia. I am a US citizen but I am hoping to work in Australia once I move there. I have my Bachelors of Science in Advertising and Communications from a University in the US. Will that help me with my work visa at all? I am not sure how long I will be staying. Whether it be a year or forever. Would it be best to start off with a Holiday Visa and then attempt to get my Permanent Work Visa if I get an employer to sponsor me? Any advice on what sort of a work visa I should go for would be appreciated. Thank you! Hi there, my grandad was Auatralian, does that allow me to apply for Australian citizenship? Hi… I am 34 from the Uk am looking to move to Auz and i don’t have a clue where to start… I have been in the printing industry for 8 years and would like to continue in printing in Austraila. hi i’am 25 and married with a 5year old son we r thinking about moving to aus but iam not sure where to start and what sort of visa would be best suited for us. My dad leaves out there and i think would have to check but iam sure he has a duel passport now and my half brother definitely does seen as his mum is australian. I am 39 and would like to move my family to australia,but I am clueless as to where to move to. We live just outside of los angeles, ca. Can anyone help as to what city would be the easiest to adjust to? Generally it is required to have access to at least AUD 5000 when going to Australia on a working holiday visa for 12 months. I AM AN INDIAN 40YERS OLD, EDUCATIONAL QUALIFICATION Bachelor of Arts, IN MFG. INDS. SINCE LAST 15YEARS WORKING IN COMMERCIAL DEPT. Like Stores-Purchase-Sales-Warehouse etc. BY PROFESSIION. AT PRESENT WORKING AS MIDDLE EXCUTIVE IN WAREHOUSE OF A KRAFT PAPER MFG INDS. ARROUND NIGERIA, WEST AFRICA & STAYING WITH FAMILY. I KNEEN TO SWITCH OVER MY JOB TO AUSTRELIA WITH MY FAMILY, MY WIFE’S EDUCATIONAL QUALIFICATION Bachelor of Arts[ENGLISH]. PLS ADVICE ME COULD I GET ANY JOB OVER THERE WHAT ARE THE VISA NORMS. Hi im 26 me and my husband and our 5 year old have been considering moving, i have the opportunity for an imternal transfer through the company i work what visa should i look into. You can send your CV at contact@visafirst.com and a visa specialist will get back to you with your options. They will give you all the necessary details that you need in order to apply for the visa. I am thinking of moving to Australia with my husband and two daughters. I am 26 and he is 29. My husband is an Electrician with 13yrs experience. Where do I start with getting a sponsorship? How much money do we need savings and is debt an issue? Any help and advice would be great. All you have to do is to send your contact number at contact@visafirst.com and a visa specialist will call you back to explain you the procedure for the sponsorship visa. my name is amy and myself and my partner want to move to australia for a better life and are dream job the only thing we are worried about is our son how will we go over with him we have family over there that will mind him. We got told that we need to do a lot before going over we just don’t know where to start could you help me please. My sista is 85yrs old, she would like to come to Sydney Australia to live near me. What does she have to do, her husband passed away so she is on her own. Can you please help. We can sponsor her. Where are you from, because your options for migration in Australia depends a lot from nationality to nationality. I am an Australian citizen of british birth , married to an Englishman and i have teenage children in Australia from a previous marriage of whom we wish to care for upon my return. We want to imigrate this year and would like to know where to start. my husband is 56 , I’m 46 would this have any effect on the application? Also what capital would we need before departure ? It’s better if you talk with our migration specialists directly, they will give you all options you have and they’ll help you decide which one is best for your case. You could fill this free assessment application form and get a free callback with your best options, or if you prefer – call directly to 0207 659 9180 (local phone). Hiya im a 27 year old senior infustructure technincian on the railway in the S&T faulting and maintenece for the last 7 years.Ihave a wife and five kids and was looking into the options of moving to australia. My sister is coming to work here on a working visa allready approved and my fathers uncles and aunties stay in australia allready. I was looking for some advice and guidance on the steps i would have to do. I done the point system calculator and seemed to have enough points just not sure if i need sponsor and what requirements are also needed. If someone could get intouch to even point me where to start be much appreciated thanks in advance. I am 33 year old single with 2 year old son from Pakistan. working here as a freelance designer through internet and locally. I want to move Australia But don’t know how it can be possible and which process can be easy? I want to know in which city i can get good job and where can i give my son best education and healthy life. I’m 22 years old and plan on graduating college next June. My boyfriend, an australian citizen is coming over in about a month on a work and holiday visa we have been dating for over 2 years now going back and forth on ESTA’s. When I graduate I plan on moving to Australia but I’m not sure of how to begin the process. If you could give me any advice I would greatly appreicate it, thanks. Hi , i’m 17 from malaysia . How if i want to move to australia new south wales. Hi suraj, it’s highly dependable of the visa type you want, try our live chat (http://www.visafirst.com/chat/) and our migration experts will help you further. You can all go together as a family, provided that either your’s mom or dad are eligible for the visa- have a skills which is on the demands list, have relevant qualifications or work experience, etc. IN regards to Your eldest brother who is 19, do you know if he is still dependent on his parents? He could be included on the visa although he is over 18, provided that the parents can show proof that he is still living with them, they pay for food, clothing, etc, that he is not working now etc. Generally the Immigration may refuse a visa if any of the applicants have serious medical conditions who require special treatment in Oz which will cost a lot of money to the Oz economy. It would be up to Immigration to decide whether or not the visa would be granted. In my opinion, this should not be an issue, as it’s not a disease what will result in expense for the Oz economy. Would appreciate your quick response. Hi there..I am Jason. I am in penang Malaysia at the moment..I want to go to Aussie, for study purposes and the fact that Aussie is amazing with its economy,I need to know everything that I have to do to get myself and my partner there. I hope that I could get some information on this matter..besides, I guess if I could get couple of contact numbers whereby I could drop a line to the appropriate department, that would be a real help for me.. Thank you. Hi, I want to move to Australia and work as a general nurse in hospitals or even GP surgery, I haven’t finished studying yet but once I would like to move ASAP how would i go about this as I am under the impression that finding working in a medical ground would be slightly different then finding work in a office etc..
Hi I am 38 years male from India. having 15 years of experience in engineering field. Want to move to Australia with family (wife and a kid 10 years old). I want to apply for PR but if i do not get a proper job I dont wanna move.. What are the pros and cons of this decision? Hi, my name is Jessica and I have some friends in Australia. I want to move my 3 sons, ages 2-11, and myself to Australia to live for a fresh start. I am trying to find help on how to do this. I have never traveled outside the US before. Hello , I am from England but when I am 18 I am hoping to move to Australia to do some sort of animal course which would give me good qualifications so that I am able to work over there in a zoo or become a vet.I am really stuck about which college to go to or how I would even go about it? I know Australia zoo do , do apprenticeships but I also don’t know a lot about this as would need a college I do have family living in Brisbane also. Hello!I I’m from greece , I’m 16 years old and I want to move to Australia as a student!Would it be difficult for me? hi,,this is jadupati Rout 34yr ,i want to move australia from india permanently,i am a graduate in arts,diploma in hotel management was 12 years ago,also Bachelor in education(BEd),pgdca in computer,english is average,can i get any job in australia?or what business can i do?so i can move with my wife 28yr and daughter 8 yr for ever,also to get citizenship.what to do?how much money require in INR,plz give details,i had never before gone outside india. Hi Jadupati, please send us your CV to contact@visafirst.com and we’ll be able to assess your visa options. Hi, my name is Paula and I’m from Argentina. I’m a civil engineer, and I’m doing a Ph.D in soil mechanics. I speak english and italian (and spanish of course). Once I finish the Ph.D I would like to move to Australia. Could I get a visa to work in Australia?? Can you please send your detailed CV to contact@visafirst.com and one of our representatives will give you a call back with all your visa options for Australia. We are a family of 6 plus pooch!! Our children are ranged from 6-16. We have the opportunity of a 2 yr contact in OZ but we are not sure of how this will effect our eldest with regard to schooling. He is just about to start A levels and Australia do not have A Levels as such, if he wanted to go to University in the UK would this still be an option for him? He could then travel back to OZ in the holidays. Such a huge move, please help. In order to be able to assess your visa options, please email us at contact@visafirst.com or call +353 56 777 0227 . My name is Melissa and I am 32 years old from the United States. I recently visited Melbourne and want to start an adventure there! I graduated from FIT in NYC and studied abroad in London and Italy for footwear design. I had to take a break from it, and take care of my mom as she was having health issues. A change would be good, and I would like to give living in a new country a try. Can you please tell me how I go about doing this? Thank you! Any help would be appreciated! can you please call us back at +353 56 777 0227 and one of our visa specialist will assess your visa options. Alternatively, you can send an email to contact@visafirst.com and we’ll contact you back with detailed information. if you could give us your contact details, we will be able to call you and assess your visa options for Australia. I’m a 25 year old Cosmetologist with a 7 year old. I am interested in moving to Melbourne. I plan on continuing to do hair and makeup professionally and would like to eventually open my own business. What is my best option in taking the step forward? Also, I’m an American as is my child. I forgot to specify.